National Ice Cream Month Recipes and Rafflecopter Giveaway from Redwood Hill Farm. Did you know that in 1984, President Ronald Reagan named July National Ice Cream Month and the third Sunday of the month as National Ice Cream Day? In the proclamation, President Reagan called for all people of the United States to observe these events with “appropriate ceremonies and activities.” I knew I liked Reagan. But sometimes there is a dairy allergy or a lactose intolerance that makes it hard to enjoy ice cream. Miss Stalin has a dairy allergy but luckily for us she can have goats milk. Until now I have been saving dessert for when she is in bed. But I also knew that it was not fair that she missed out on so many different things. Then I was approached by Redwood Hill Farms. 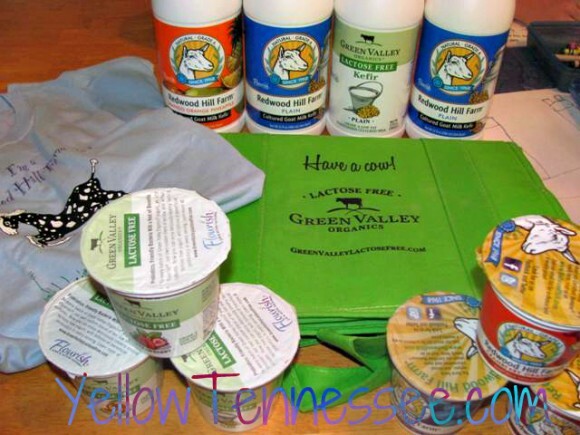 They have a line of goats milk and lactose free products. And best of all, they are from an amazing family owned, organic and sustained farm in California. Redwood Hill Farm was also the very first goat dairy in the US named a Certified Humane farm. They even name all their goats. How cool is that? I was excited to give this stuff a try and see how not only Miss Stalin liked it, but also how the rest of us liked it. It is important to me not to have to buy separate items for each of us. I need simple and I need to know that not only can Miss Stalin have it, but that Genghis will enjoy it also. I was in heaven. And I could not wait to get started. So first off, we all had some yogurt. Everyone loved it and I didn’t tell Genghis that it was made from goats milk. He had no idea. We now have yogurt the entire family can enjoy! But this is July and it is National Ice Cream month. 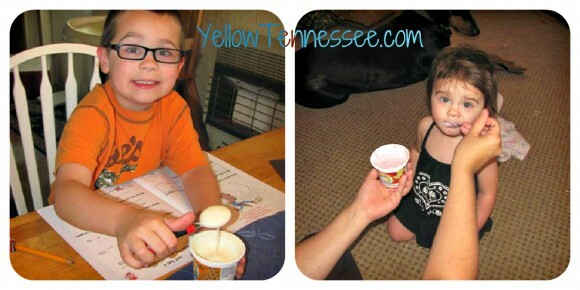 So this review would not be complete without some ice cream! I will admit that I was a little scared. I’ve made homemade ice cream before and it was good but it was also using real cream. Never have I used goats milk kefir in anything. So I was not sure how it would turn out. I did use a recipe from the Redwood Hill Farm website and tweaked it a little bit to fit with what we needed. Combine sugar, cocoa and boiling water in a large bowl. Whisk or stir until well blended. Slowly stir in kefir until well blended. Cover and place in the fridge until chilled. I then added the mixture to my electric ice cream maker and let it do its thing. A few hours later and we had chocolate ice cream that the entire family could enjoy. But maybe chocolate is not your thing. In that case, try these wonderful Popsicles. 5 cups Redwood Hill Mango Orange Pineapple Goat Milk Kefir. 3 fresh peaches (peeled and diced). 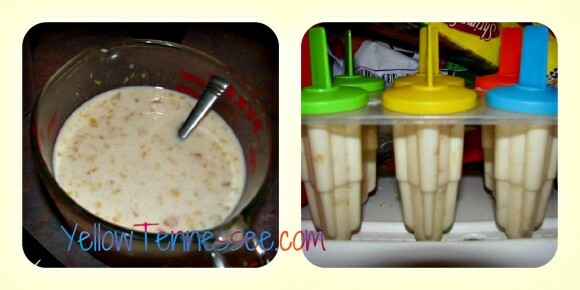 Combine both ingredients together and mix well. Then enjoy. 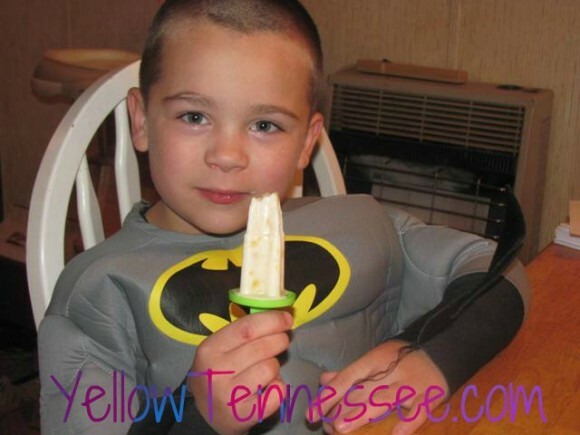 Even Batman likes them. 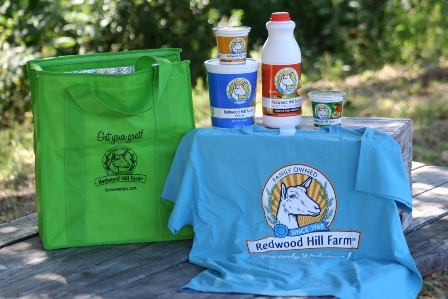 One lucky winner will receive an insulated tote, t-shirt and a selection of Redwood Hill Farm products.